There was a meeting of worlds, not as a violent crashing together as so often happens, but as a gentle touching, a meeting of inner and outer, from one to another. Held in the vessel of one moment in time, there came on seamless flow a meeting of personal pain and heartache and the pain of the world all around. The two became as one, the pain of one person, of all people, and the pain of the world, the world itself and of all within. That is why we were there, gathered at the State House to declare a “higher moral ground,” calling for redress beyond politics of all that besets this earth, of all that hurts people, that chains and embitters the lives of human beings, in this country, everywhere, all as strands of creation indivisible. We sang, we prayed, words spoken to encourage and inspire. There is so much to do, so easy to despair, to heal a feverish world, to lift up from poverty, to fix the justice system, to insure health care for all as a human right, and so education and employment, all the necessities of life, and the right to joy as well, bread and also roses. We heard stories of personal witness and testimony. We were as one, addressing together the challenges that weigh upon us all. And then we began to spread out in walking vigil around the State House. As we walked, I found myself standing alongside an African American man whose collar told me he was a minister. I held out my hand and introduced myself, and he extended his hand to me. “Hi, I’m Ron Odom,” he said with a smile. Our hands still clasped, his name took my breath away, for a moment unsure of what to do or say. I placed my other hand on his shoulder, “I’m sorry,” I said, “I’m so sorry,” speaking as to a mourner in the freshness of grief, and so it shall always be for him. In the sharing of names, the meeting of worlds, inner and outer, from one to another. We walked on quietly for a moment. I did not want to press him to say more than he might wish to say; nor did I want to ask more than he might wish to hear. Holding all the pain of the world as we walked, he began to share his own pain, worlds become as one. A moment in time when all becomes one, I kept repeating his words as we parted, words of prayerful hope for himself, for each other, for the world. I wanted to comfort him, but he had comforted me. With so much hurt in every heart, the only hope is in our coming together. In the meeting of worlds, inner and outer, we hold the world’s pain and our own. It is a teaching that flows beneath the surface of the Torah portion Ki Tetze (Deut. 21:10-25:19). The portion begins with laws of warfare, seeking somehow to humanize the inhuman, ki tetze lamilchama al oy’vecha/when you go forth to battle against your enemies. Through the lens of Chassidic teaching, the surface meaning is immediately transformed, turned upside down. Enemies are in the plural, but the Hebrew suffix of address is in the singular. So too, the whole sentence is addressed to the individual, set in the second person singular, ki tetze/when you go forth to battle, understood, therefore, as going forth to battle your own personal, inner enemies. There is a meeting of worlds, of inner and outer. The Slonimer Rebbe teaches that your enemies refers to ha’oyev ha’m’yuchad shel’cha/your own unique enemies, and then he adds his signature theme, l’chol adam yesh tafkid m’yuchad she’tzarich l’mal’o/every person has their own unique task to fulfill, u’l’shem kach ba l’olam/and for this purpose they have come into the world. We each have a special task to fulfill in this world. In order to accomplish that task, we must first overcome our own personal demons. In the context of Ki Tetze, inner and outer become as one, and in the meeting of worlds violence is transformed. Our own bodies and souls are scarred by all the strife and struggle in the world, and we are soothed by so much love and goodness that flows from heart to heart. Seeking wholeness in the world and among people, we seek it for and within ourselves. I thought of Rev. Odom’s name as I read the parasha. In Ashkenazic pronunciation, odom is the human/adam. Odom ha’rishon is the first human, male and female within one, all humanity descended from one. In Jewish mystical thought, before there was odom ha’rishon, there was odom ha’kadmon, the primordial human whose form became a template for all of creation, the world created through the human form, world and human, inner and outer, all as one. It is made clear in the Torah itself at the end of last week’s Torah portion, Parashat Shoftim, war challenged again from within itself. There, in a context of ultimate violence, another cry rising against violence, against destruction, a warning not to destroy trees for the sake of making war. The Torah says so simply, ki ho’odom etz ha’sadeh/for the human is the tree of the field. A teaching so poignant and powerful, if we are not to destroy trees, how much more so are we not to destroy people, for we are the trees of the field. Walking together for the sake of the world, earth and people as one, we find ourselves hand in hand with a friend, a meeting of worlds, inner and outer, offering strength from one to another. As I was walking up the stair. I met a man who was not there. I have thought much about the kinds of loss that permeate the massive population movements as so many individuals and families are uprooted from their homes because of war and violence that make their lives untenable. I have thought much about the communities who either welcome them and try to make them feel secure and at home and about the communities who say “No” we cannot make a space for you. I have tried to imagine what it would be like to pack only what I could carry in a blanket or a suitcase and run for my life in the middle of the night -leaving behind all that is familiar - if not predictable and safe. No matter where I let my imagination wander, there is a universal and profound sense of loss. 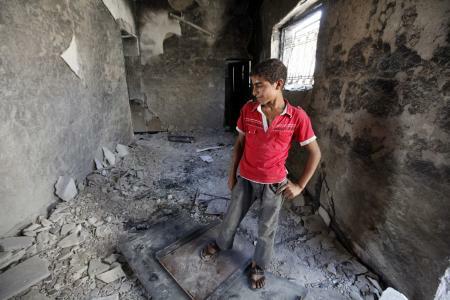 In an instant, life as it was disappears when bombs and mortar fire level a home and a family, whether still intact or permanently broken, loses everything. 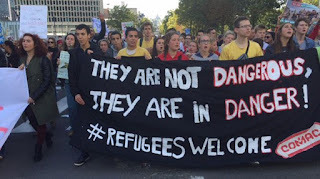 The grief that pervades life in refugee camps is ambiguous. Soon it may be possible to return home. Soon life may be normal again. Soon a missing family member may arrive on the doorstep. But in the waiting, grieving goes on and on and on and there is no “normal” resolution. Everything just sort of hangs in abeyance. I listened this morning to a piece on NPR about one church’s efforts to resettle one extravagantly vetted Syrian refugee family. Church members talked about the issues involved - the costs in time and energy and labor and support - to help just one family to make the transition to life in this country. They spoke of the labor of love required. 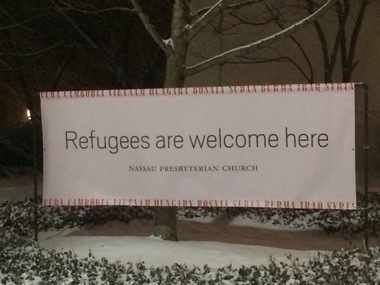 I wondered how the welcoming community acknowledges the depth of the loss that even one refugee family encounters. I wondered how one keeps hope alive and lives into the future when the losses are so ambiguous at times - so open-ended and without resolution. So - I thought about a day of mourning in solidarity with all who live and cope with the “unclear and indeterminate” losses that come not only through immigration, but also through things like the death of a marriage through divorce; the re-shaping of family relationships when one member is estranged; the loss of a clear and shining future to the complexity of climate change; the loss of tribal lands to invading forces; the loss of a loved one missing in action. Ambiguous Loss - Learning to Live With Unresolved Grief by Pauline Boss, Harvard University Press, Cambridge Massachusetts, 1999. P.
Imagine a large piece of prime farmland where your relatives have lived for generations, getting married, working hard, raising up children, worshipping, being laid to rest. These days, the old family graveyard isn’t used anymore. The fieldstone fence surrounding it is tumbledown and overgrown. Most of the gravestones are so weathered you can scarcely make out the names and dates. But the dead who are interred there are still part of you. As one of their descendents, you feel a connection to them, deep in your bones. On a certain day a very rich farmer from far away comes along without warning and lays claim to some of your family’s farmland. The law, he says, is on his side. Before you can dispute him, he’s clear-cutting trees, digging new ditches, even changing the course of the river. And now he’s getting ready to demolish the family graveyard. He plans to till up the old plot, adjacent to one of his fields, so he can plant it and increase his yield. You and your relatives pay him a visit, to protest. He’s deaf to your appeals. So you file a legal complaint. Before the judge can hold a hearing, the farmer shows up at the graveyard with a bulldozer. He brings along some of his buddies armed with guard dogs and pepper spray. You call the sheriff to intervene. No patrol cars come. 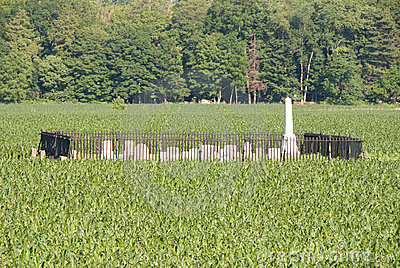 As you and your relatives yell and gesture in righteous anger, the rich farmer razes the old graveyard. Six of you are bitten by dogs. Thirty more are disabled by pepper spray. In only an hour or two, the final resting place of your ancestors is leveled, and nothing, nobody, will ever be able to put it right again…. This could never happen in America, you might be thinking. It’s a made-up story. But last weekend much of this (and worse) actually played out near Cannonball, ND. Instead of a “rich farmer,” the bad actor was Energy Transfer Partners, the company building the Dakota Access Pipeline. Instead of “you and your relatives,” the burial sites belonged to native people. I’ve a hunch that if an Indian-owned company had sicced its dogs on white people protecting a white cemetery, the mainstream media would have been all over this story. Lawsuits would already have been filed against ETP. Heads would have rolled at the Morgan County Sheriff’s Office for not protecting the white demonstrators. 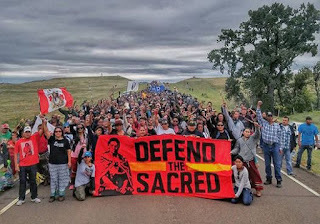 But as it is, the media has largely been silent about this incident, or it has insinuated that the Indians who nonviolently resisted the desecration were somehow to blame. Even if I weren’t opposed to DAPL, the events of last weekend would have offended my conscience. And I hope they offend yours. Can we agree that it’s unconscionable for any company to deliberately destroy any burial site for the sake of its own bottom line? Can we agree that it’s unconscionable for any company (or government, or law enforcement agency) to assault citizens who are nonviolently exercising their constitutional rights to assemble and speak their mind? Call Vicki Granado, the public relations officer at Energy Transfer Partners (214-599-8785), and express your dismay over these abuses. Call the Morton County Sheriff's Office (701-667-3330) and remind them of their responsibility to protect peaceful citizens. Call North Dakota Governor Jack Dalrymple (701-328-2200) and ask him to help de-escalate the situation. Finally, call the White House (202-456-1111) and urge President Obama to do what he can to ensure that justice holds sway. It's all about water! Although there has been spotty media coverage, a rather amazing event is unfolding in the fields of North Dakota. Indian nations are gathering and praying to stop the Dakota Access Pipeline from crossing the Missouri River. For those who are willing to take the time to investigate, it is quickly apparent that these are not "protesters" but "protectors." For those of us living in a bubble of purchased immunity, we little realize how our most important resource is increasingly at risk. After all, for us the water flows out of the faucet or shower head into and over our bodies and we don't think long and hard about the origins. We have such short memories. The worst U.S. land based oil spill occurred in 2010 into the Kalamazoo River in Michigan. Over a million gallons of diluted bitumen went into the river. A heavy crude oil from the Alberta tar sands, much of it quickly sank. Thirty five miles of the river were closed and more than four years of clean up followed. Three quarters of a billion dollars were spent trying to bring the river back. Subsequent investigations revealed that alarms had warned the Enbridge headquarters there had been a pipeline breach. But operators assumed it was a "bubble" in the line and continued pumping oil for eighteen hours. It was also revealed that Enbridge knew of pipe weakness in that area five years earlier, 15,000 defects in the 40 year old pipeline, but decided not to dig it up. Or I doubt people even heard about the Canadian spill in July. 200,00 liters of crude oil spilled into the North Saskatchewan River. It took officials four days to shut down the pipeline. Communities downstream like Prince Albert were "stockpiling clean water in bathtubs and Tupperware containers." One Canadian official doubted their drinking water would be safe to drink for months. For those with short memories, please recall the leak from Keystone 1 near Freeman, South Dakota this past April. Even with all the fancy equipment to detect spills, Transcanada had to be contacted by a farmer watching oil pool in a field. And although they first reported a spill of 187 gallons, they had to revise it once they started digging to16,800 gallons. All of that four football fields from a "sensitive environmental source," like a river? According to Richard Stover of the Center for Biological Diversity, using records from the Pipeline Safety Administration, there have been close to 8,000 "significant incidents" with pipelines between 1986 and 2014. 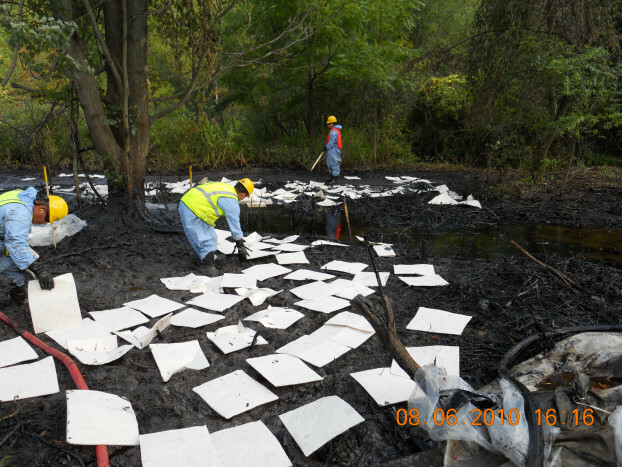 More than 3 million gallons on average spilled in the U.S. each year, an average of 5 incidents a week. Significant incidents are those "causing injury, death, damages exceeding $50,000 in value, a loss of 5 barrels of highly volatile substances, 50 barrels of other liquids or there was an explosion. There have been more than 500 human deaths and 2,300 injuries through-out that period. The number of plant and animal casualties is far higher. The known property damages are valued at close to $7 billion." The proposed Dakota Access Pipeline would not only cross the Missouri River but the Big Sioux south of Sioux Falls. It would impact four Wetland Management Districts in South Dakota: Sand Lake, Huron, Madison and Lake Andes. The pipe is already in the ground in many places, with desperate fossil fuel companies and their political cronies, their very existence in jeopardy, frantic to get it out of the ground before the market completely collapses. 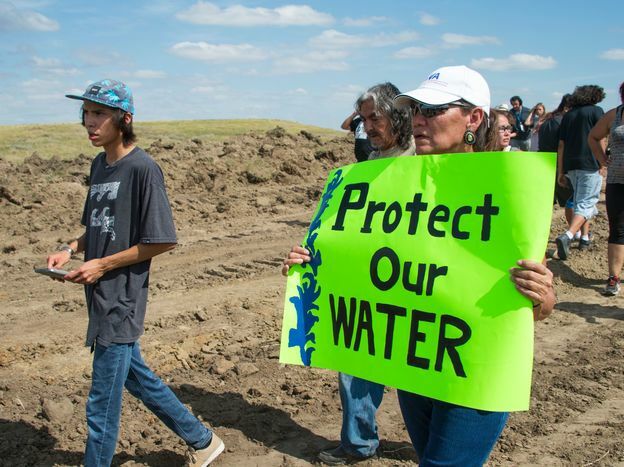 In North Dakota, the Sacred Stone camp is all about water. People there are asking us to care about the residents of Baton Rouge, LA, who saw 21 inches of rain in 24 hours; to care about the business people of Ellicott City, MD, who saw their downtown ravaged by 6 inches of rain in 2 hours; to care about the 80,000 people who have been evacuated in CA because of wildfires and too little water; to care about those all over the world sickened and starving by draught. They are asking us to care about a livable world for our children and grandchildren, facing the likelihood of catastrophic climate change. So when some try and play a "race" card and suggest it's just unruly Indians at the camp, don't believe it. Many non-Indians are campers and supporters. And when they spread rumors of pipe bombs, know the pipes are peace pipes. And when they say it's not a lawful gathering, be aware it's not natural law being broken nor God's law. It's past time to say leave the fossil fuels in the ground. The future is in renewables. And there is no future without clean water. The voices of women cry out from the weekly Torah portion called Pinchas (Numbers 25:10-30:1), giving challenge to patriarchy and offering a new way. At times, even they lose the way, but then it becomes for us to remind and to challenge in turn, all while celebrating the possibility of change even as it unfolds before our eyes, as if in a dream. In the portion of Pinchas, a challenge to power and to the way things have always been is offered by women as a way for all of us, a way that is modeled and meant then to transcend gender, meant to become a new way. Unfolding against a backdrop of violence, a zealot more comfortable with the spear than with words, taking the law into his own hands in the way of tyrants, taking no counsel with others, only he to save. At the end of the preceding portion, Pinchas slays Zimri and Cozbi, an Israelite man and a Midianite woman, running them through with his spear. As so often, the Torah sets a context of violence which is then challenged from within, a stream of nonviolence rising up, waters breaking in birthing new possibility, a new way of speaking and challenging, of leading. God makes a b’rit shalom/a Covenant of Peace with Pinchas, painfully ironic, meant to wean him from violence, to offer an antidote, some suggest. Subtle challenge is offered, the Hebrew letter made as a straight line, the “vav” in shalom is broken in two, the only place in the Torah with a “vav,” or any other letter, so written, a broken spear, an incomplete covenant. Of the many challenges to the violence that pulsates in the very name of the portion, in the way of the man for whom it is named, the voices of women lead the challenge. We don’t always hear the voices of women at first, in Torah and in life. Is it about quality of voice, about trust, about likeability, all standards not applied in the same way to men? The irony is underscored in the portion. Moses is told of his coming death, that he will not enter the land. In a beautifully magnanimous response, his first concern is that the people not be as a flock without a shepherd. Moses pleads, Let God, the God of the spirits of all flesh, appoint a man/ish over the community. In a portion filled with the voices of women, it is an irony that laughs aloud, that begs for redress. Why not a woman? Of women who offer a different way, we encounter Serach bat Asher, a singer of epic songs, a player of the harp. From the Torah itself, we know only of her name and lineage, her character filled out through legend and lore. When Jacob’s sons return from Egypt, having discovered that their brother is still alive, they wonder how they will tell their father Ya’akov, without causing shock, that his beloved Yosef still lives. They see the young Serach playing music and they ask her to sing to their father, preparing his heart with song to receive the good news ever so gently. She who is said to have been received alive into the Garden of Eden is still there to tell Moses on the eve of the Exodus where the bones of Yosef are buried. Charming his metal coffin from the Nile, she allows a promise to be fulfilled, that Yosef’s bones be taken with them in order for Israel to leave. We encounter in this portion Yocheved and Miriam, mother and sister of Moses, women who affirmed life in the face of all that would deny it, song and dance the way of this holy sister. When Pharaoh decreed death for all the sons of Israel, couples separated from each other in order not to risk bringing children into such a world. The little girl Miriam told her parents that in their separation from each other they were worse than Pharaoh, who had decreed only against sons, but they against daughters as well. In their coming back together, Moses is born, the liberator emerging. 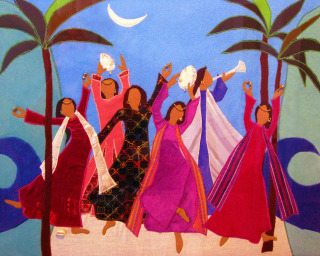 Beyond the parted waters of the sea, now on freedom’s shore, the woman Miriam takes her timbrel in hand and leads the women in dance and song. Having learned her way of life and love, it is for us to remind even Miriam not to offer song upon the drowning of the Egyptians, but only for our freedom to sing. Falling back upon the ways of men, their song of might and power, Miriam’s own way of love and compassion for us to hold and remind. Central to the Torah’s response to Pinchas, the teaching of another way, the daughters of Tzelophchad arise, central to the telling, teaching the dynamics of sacred struggle. They are five sisters whose father has died without a son, five who bravely stand in the face of all that has been and plead their case to inherit, Machla, Noa, and Choglah, Milkah, and Tirtza. In the openning word of the Torah’s telling of their cause, va’tik’rav’na/and they drew near, we learn an essential dynamic of nonviolent struggle. Drawing near, approaching the other, human connection is made, not to stand at a distance, spear in hand in the way of Pinchas. And then we are told, va’ta’amod’na/and they stood. Even as they draw near, seeking connection, they bravely stand their ground, teaching the way of speaking truth to power. Moved by the strength of their manner and way, Moses takes their case before the Holy One, announcing then to all assembled, ken b’not tzelophchad dovrot/surely the daughters of Tzelophchad speak justly. In that very word dovrot/speak, from the word for word itself, davar, the way of the word is affirmed. Her cry continuing to rend the heart, every mother’s wail for a son lost in battle, the last of the women we encounter in Parashat Pinchas is the woman we know only as Sisera’s mother. In the midst of the portion are all of the passages that become the additional readings for every Jewish holy day. Of Rosh Hashannah, the New Year, we are told, Yom T’ruah yihiyeh l’chem/It shall be to you a day of sounding the shofar. Looking to the Targum, the Aramaic interpretive translation of the Torah, the rabbis bring us to a place of deeper association and human connection with what we are to hear in the voice of the shofar. So different, the Aramaic says, Yom yabava y’hey l’chon/It shall be to you a day of sobbing. How do we know that yabava means "sobbing," and whose sobbing is it? As told in the Book of Judges, it is the sobbing of the mother of Sisera who waits for her son to return from battle, knowing in her heart that he will never come, b’ad hachalon nish’k’fa va’t’yabev em Sisera/through the window peered the mother of Sisera and sobbed (Judges 5:28). In the broken notes of the shofar, it is simply the sobbing of a mother who has lost her son. That Sisera was a brutal enemy of Israel is never mentioned. In what becomes the least known name of Rosh Hashannah, Yom Yabavah/Day of Weeping, from Sisera’s mother, we learn the way of compassion. The voices of women cry out from the portion of Pinchas and challenge his brutal way. 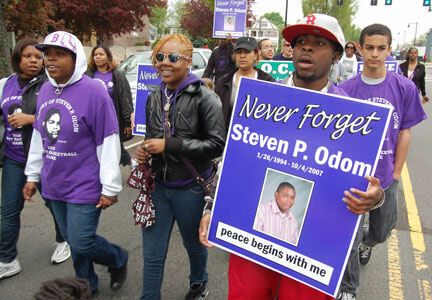 It will take all of us to shape the path formed of words rather than weapons, all of us to remind when the way is lost. As Moses calls for a man to lead, an irony that laughs aloud, a new day is rising with laughter and tears. The time has come.